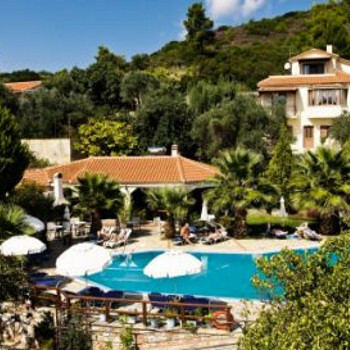 Off the beaten track, the Sergios are set in beautifully kept gardens amidst the fragrant pine woods and olive trees of Koukounaries.Well maintained and with a welcoming atmosphere, these studios and apartments come highly recommended. A torch is required. Myself and my partner have just retunrned from a weeks holiday on the island of Skiathos where we stayed at Sergio's in Koukounaries. I have to say that these studios are absolutely fab (we stayed in No 15 2 person studio). The rooms were very clean and the gardens surrounding the studios were beautiful and peaceful as Sergios is set away from the road. The studios also have an amazing swimming pool with a lovely pool side bar where you can get snacks and drinks (stays open until midnight). The beautiful Koukounaries beach is approx 15 mins walk away and bed hire is approx Eur8 per day for 2 beds and umbrella. By day Koukounaries is busy as the beach a quite big with lots of water sports and day trippers. By night this part of the islands becomes a lot more quiet and relaxed. There are around 10 maybe more restaurants to chose from although we decided to venture a few nights into the town of Skiathos which is very easy on the local bus and takes 30 mins and costs Eur3.60 per person as apposed to a taxi which costs Eur20 approx. I would recommend anyone to stay clear of a restaurant in Koukounaries called 'Georges' which was over priced and very very very bad. The food portions were tiny and cold and you had to pay for your food upfront which should have indicated to us there and then that something was very wrong but heh you live and learn. I would recommend anyone to stay at Sergios if they want peace, relaxation, self catering and a friendly family run business. A big thumbs up to Sergios. As this was our first trip abroad with 2 children aged 5 and 7 we were anxious that this accommodation would be suitable for our needs. We need not have worried - everything was perfect for us. The accommodation was clean and the patio area and gardens were large and pretty and well maintained. The staff were great - even when my daughter managed to fall out of bed and smash 2 plates! We hadn't expected clean towels every day but there were plenty for us all, and the apartment was swept out 6 out of 7 days and kept very clean. The pool was clean, very deep, but pleasant with plenty of sun beds. The "road" to the apartments was very dark at night - so take your torches. Although a quiet resort we as a family would happily return. Fantastic appartments - quiet, clean and very private. Staff were extremely helpful , very friendly and very generous with their time & advice. We stayed at Sergios apartments on an allocation on arrival late deal. The rep could not believe we had been sent to Sergios as it is often fully booked with guests who return year after year. The accommodation is basic but very clean. Beds were a bit hard but we asked for blankets to pad them out. The setting of Sergios makes up for the hard beds. Off the road up a beaten track but so peaceful and quiet with wonderful views to the surrounding countryside set in lovely gardens. The pool was small but great setting getting sun late into the evening. About a 10min walk to beach. Loved it so much we are going again 2005 but could not get booked into Sergios. We will be staying at Panarama in same resort in August so watch this space.